Are you looking for ways to exercise while traveling? Staying healthy is important. No matter what you do in life, exercise can save your life. During a time when cardiovascular diseases are the number one cause of death globally, most of us need to start being more active. It’s not always easy to do depending on where you live. Some live full time in their RVs and travel around and feel like they don’t have access to any exercise equipment or gyms. The first thing I want you to remember is that you don’t necessarily have to go to a gym to get a workout, you also don’t have to lift heavy weights. Exercise can be as easy as biking, swimming, climbing stairs, jogging or even walking. According to the American Heart Association, 30 minutes a day five days a week will improve your heart health which leads to a reduced risk of heart disease. To exercise while traveling is just as important as exercising while not traveling. What I want to share with you today is the portable exercise equipment you can use if you’re tired of just walking or running and want to do something different. Maybe you’re the kind of traveler that stays in hotels and need something you can use indoors. It will be a mix of all different types of equipment. Do you love kettlebells? They can be useful and give a workout for your whole body. This kettlebell from PKB lets you decide how much weight you want to lift, and it’s genius for travelers. The way it works is that you fill it with sand, dirt or water (water tank sold separately) until it weighs as much as you want. They come in three different sizes, and the largest one is supposed to weigh 45 lbs when filled. And you don’t have to worry about them breaking since they are rated for 1800 lbs tensile strength. The handle is made out of anodized aluminum, which makes it light but durable. 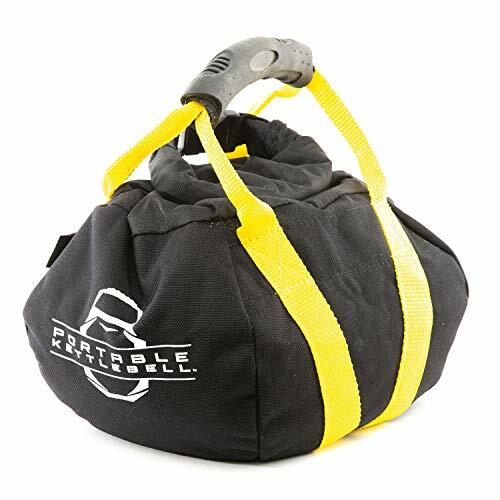 I like the PKB Portable Kettlebells because it offers weights when traveling. You can’t put a 15 lbs kettlebell in your luggage because you would run out of your 50 lbs real quick. Sure, you could put some weights in your RV, but you’re already limited as it is. Why not use a portable kettlebell and fill it with water that you can dump when you’re ready to hit the road again? Training straps are great for beginners that that don’t want to lift kettlebells and weights over their head and body. By using a suspension strap, the worst thing that could happen is that you can’t pull it anymore. The TRX GO Trainer strap comes with exercise guides, and there’s also an app to download that will take you through a complete workout. This is a very travel-friendly option that can still make you breathe hard. Take it out of the mesh bag and you’re ready. The fact that this is supposed to be used both indoors and outdoors means you can not only use it in your RV but also take it out in nature. It could also easily be used in a hotel room. Here we go back to the basics, push-ups. Instead of putting your hands on the dirty hotel floor or sandy RV floor, you can use these. Okay, that’s not the only reason Legend Pushup sell them. They advertise that they’ll eliminate wrist pain that you might get from the standard push-up. An excellent way to keep your wrists happy and to help you not get discouraged to work out. The handles have two modes, Rocking mode, and Stable mode. The Rocking mode is supposed to activate more muscles while the Stable mode functions like a regular push-up bar. To swap mode, you turn it upside down. 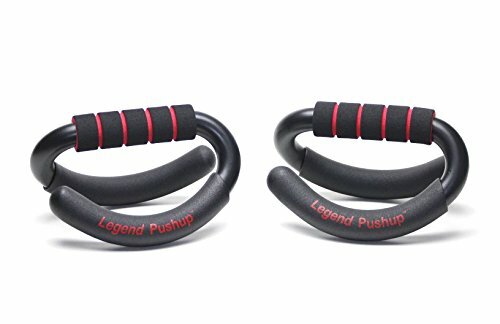 If your favorite exercise is push-ups, the Push Up Bars by Legend Pushup can be the best equipment for you. A pair does weigh 3.2 lbs but it can be worth it to save your wrists from injuries and unnecessary tear. If you feel limited with just one resistance band, this kit might be something for you. With five bands included, you have the option to choose how many pounds you want to pull. From the yellow 2-4 lbs band to the black 25-30 lbs band. Personally, I like to use resistance bands because that way I can stretch my muscles and I decide how much resistance I want. I have had a similar kit to these for a few years and I recommend them for beginners. 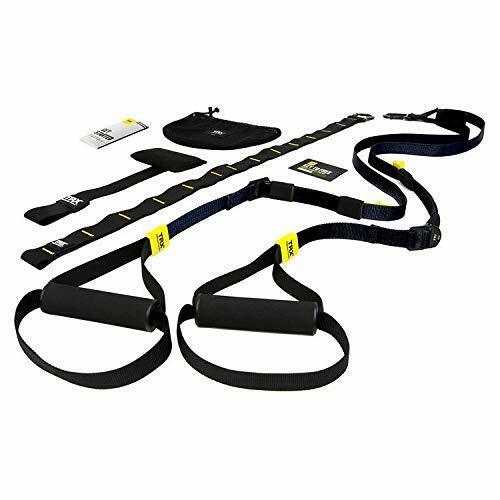 The Black Mountain Products Resistance Band Set includes a door anchor, exercise chart, carrying bag, ankle strap and starter guide. It has everything you need as a beginner and I definitely recommend it for travelers. Want to pull a card? Well, then you have to do the exercise that is presented to you on your card. This is a great set for a beginner that doesn’t know a lot of exercises and is looking for inspiration. Bring it with you anywhere you go. Especially travel-friendly since they don’t require any equipment, all it takes is some motivation. 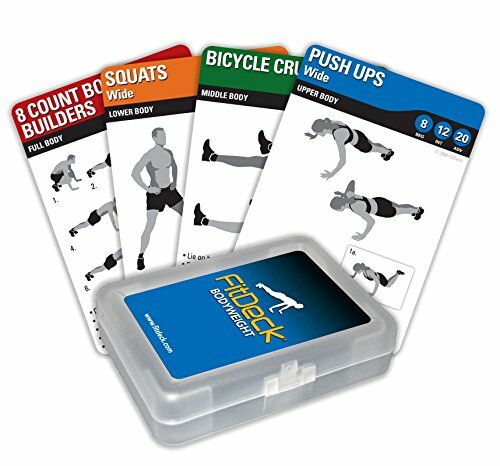 The full body-weight deck comes with 56 casino-quality cards and will give you a full-body exercise. Sure, an app on your phone could do the same thing. But having the cards in your hand can be more convenient if you use them regularly. To not have to worry about battery life, the phone screen staying on, and the cards getting dirty or wet, are all great pros in comparison. These last three products are not something you can take with you on a plane, but they’re not impossible to keep in an RV so that’s why they made the list. Starting with this foldable exercise bike made by Marcy that has adjustable resistance levels so you can do both cardio and strength workouts. Its weight max rating is 250 lbs and it comes with a screen that gives you information like speed, distance, time and calories burned. The display is powered by 2 AAA batteries which makes it camper friendly because you don’t need power through an outlet. Having an exercise bike in an RV might seem dumb because you could buy an actual bike and go on a ride wherever you are. Well, some of us stay overnight in Walmart parking lots or all the way in the woods where there is more hiking than biking friendly paths. Being able to always get on an exercise bike is great and will let you stay in shape for when you can take your mountain bike out on a trail. 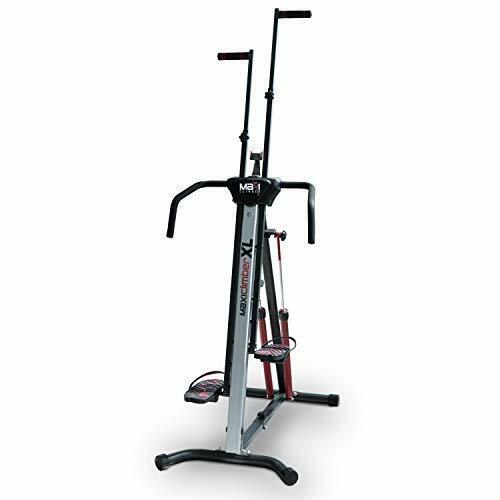 The Marcy Foldable Upright Exercise Bike is a good choice if you have space for it. Folding bikes are becoming more and more popular and for a good reason. Biking is fun and a quick way to explore a new city or ride around the campground. Meanwhile, you’re getting exercise. This folding bike from Schwinn is made for both women and men and has 20-inch tires. The folded size is 29.5 inches x 29 inches x 19 inches which is not bad at all for a bike. It comes with a Shimano shift and derailleur, a very trusted brand in the bike industry. This bike is so portable that you can store it indoors when not in use. Being able to store a bike indoors will not only keep it safer from thieves but will protect it from the weather. 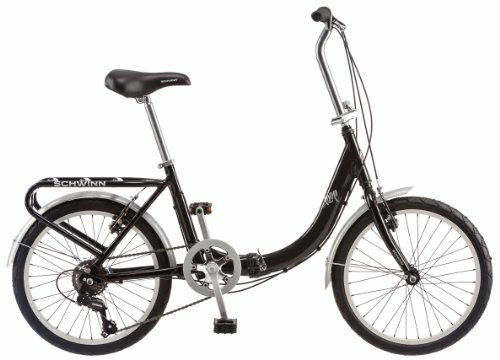 The Schwinn Loop Folding Bicycle has front and rear brakes, kickstand, 7 speeds, and a carry bag is included. This is one of those “As Seen On TV”-products that you either love or hate. It will give you a full-body workout though and I can promise you right now that it will make you sore. While being friendly to your knees and ankles, it’s easiest explained as climbing a ladder. The reason I put this on the list is that I can see somebody storing this in their RV and bring it out and do a workout outdoors. It’s good because it gives you a hard cardio workout in a short amount of time and it folds down for easy storage. I understand that the “As Seen On TV” gives you doubts about what it claims to do, but give the MaxiClimber a chance and you’ll feel whether it works or not. For the intermediate to the expert athlete: TRX GO Suspension Trainer System – Great trainer kit that gives you a quality workout in a very portable package that you can bring with you no matter where you’re going. If you’re into lifting weights: PKB Portable Kettlebells – The fact that you can decide precisely how heavy you want these to be by filling them with more sand is so great, so versatile and so much can be done with kettlebells. Great for traveling. 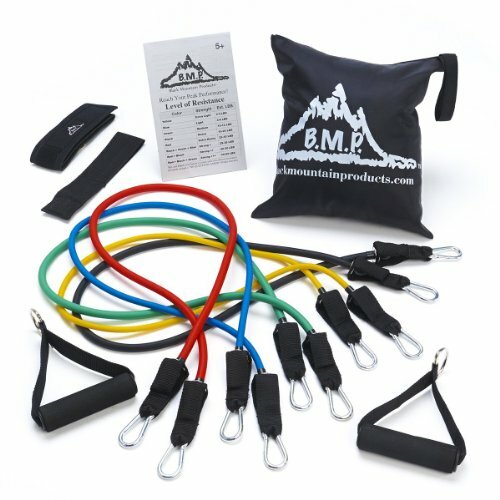 For the beginner: Black Mountain Products Resistance Band Set – I bought a resistance band set as a beginner and I quickly fell in love with how many exercises I could do with all different kinds of resistance. These are great and can be used anywhere you wish and quickly goes into a bag or storage when not in use. If you have space and like biking: Marcy Foldable Upright Exercise Bike – If you like biking this should be your exercise method. It’s so much fun to go biking through a town or the woods on a trail, and it’s easy to forget you’re exercising. Fold this down and store it in your RV while traveling and then fold it up and store it outside at the campground. I hope I have helped you find ways to exercise while traveling if you live in an RV Full-Time or just stay in a hotel occasionally. Let me know in the comments down below if you have any questions.